So, bar Marlene Hassan Nahon, who remains an independent MP, the GSD is one big happy family again. Ex deputy leader Damon Bossino is back in the executive. Lawrence Llamas, who must surely hold some kind of record, has returned to the fold just ten months after quitting the party with which he was elected in 2015. Harmony reigns. Or does it? I’m reliably informed that neither man enjoyed the unanimous support of the executive committee. 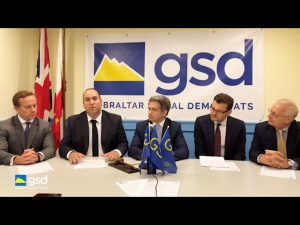 Some in the GSD felt let down by Mr Bossino when, following his unsuccessful bid for the leadership in 2013, he declined to seek re-election two years later having served just one term in opposition. Since then there have been persistent rumours that he still harboured hopes of one day taking over the reins or, alternatively, forming a new party of his own. He did little to dispel these rumours. When the post of GSD leader became vacant last year Mr Bossino decided not to stand, but was careful to say: “on this occasion”. And interviewed by GBC last week, he did not deny that he had been planning to form a political party. He admitted talking to people outside the GSD but said “nothing very serious came of it”. 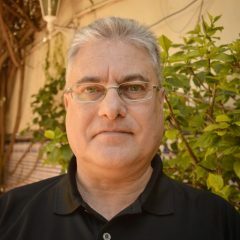 In fact, my information is that both Mr Bossino and Lawrence Llamas were part of a cabal including GSD members that was exploring the possibility of forming a third party. As to Mr Llamas, his readmission was actually touch and go. At least two of the GSD’s five MPs voted against and had voting been by secret ballot, as the MPs wanted, the likelihood is he would not have been welcomed back. Mr Llamas claimed it was “only natural” that he should return to his “political home”. But that sits ill with his resignation statement in July 2017 when he said his views and those of the GSD were “set on worryingly and irretrievably divergent paths”. In his Christmas message last year he spoke about working “with a growing number of people” and urged others to join them. Hardly the kind of talk you’d expect from someone who would submit to the GSD whip just five months later. Maybe the self-styled “conviction politician”, who had pledged to stay on as an independent for the remainder of this parliament, came to realise he had little prospect as things stood of retaining his seat in the next one. 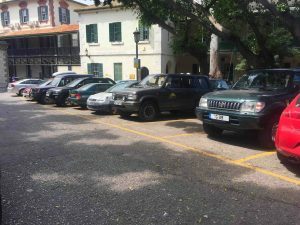 On Friday 16th March infrastructure minister Paul Balban told parliament that in six to eight weeks’ time the residential parking Zone 2 bays then lying empty would probably be filled. The scheme had to bed down, he insisted. Well, nearly ten weeks have now elapsed and the situation has not appreciably improved. Not along Queensway anyway. Yes in some places, Governor’s Parade for instance, you see more cars in the demarcated yellow bays than before. But along Queensway parking spaces remain stubbornly vacant while pay car parks burst at the seams, with no room left for frustrated drivers. 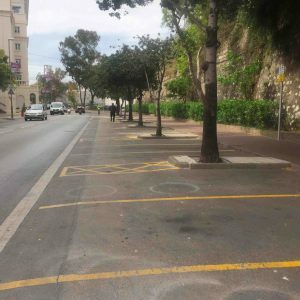 Logic suggests there simply isn’t the demand for so many restricted parking spaces on this road, and that the community would be better served if the bays were free or pay-and-display instead. How about it Mr. Balban? 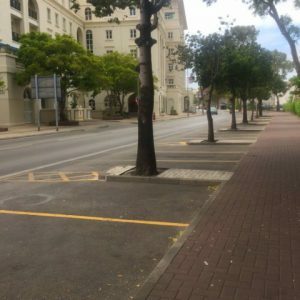 The day after I published this post, the government announced changes to the parking arrangements at the southern end of Queensway. The bays opposite Queensway Quay will revert to free parking between eight in the morning and midnight and will only be restricted to Zone 2 permit holders overnight. A victory for common sense! This government lays great store by consultation. Possible incentives for inward investment would be considered “in consultation with professionals in the private sector”. The government would “continue to consult the industry on the level of port fees”. The Nature Reserve Management Plan would be rolled out “after a full consultation process with all stakeholders”. There would be “close consultation with stakeholders” over the future of The Mount. The government would “continue to work closely with and consult with interest groups” in relation to its equality policy. What then are we to make of recent events? The aforesaid manifesto speaks about consulting teachers and the teachers’ association on relatively non-contentious matters. For instance restructuring the schools’ advisory service and providing hot school meals. It’s hardly surprising, therefore, that elements of the profession were concerned when the major decision to replace Bayside and Westside schools with two new, co-educational schools next to each other was announced with what many teachers considered to be insufficient consultation. 89% of teachers surveyed by their union supported the decision to build two new secondary schools. But 81% did not agree they should be located adjacent to each other and 80% wanted the government to reconsider and build the schools in separate locations. 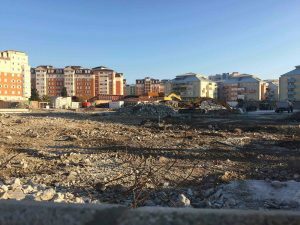 However, with the Waterport site where they’re set to be built now fully demolished, there appears to be little prospect of further consultation, at least on this particular aspect of the project. Unite the Union has always had a cosy relationship with the GSLP/Liberals. In 2015 it publicly backed them just days ahead of the general election. Yet the relationship came under strain recently over the Grand Home Care/MedDoc fracas and what the union sees as a government policy of privatisation through the back door. 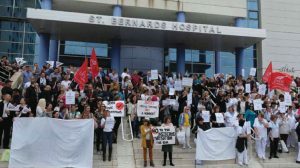 400 GHA members attended a union-organised walkout – not much consultation in evidence there. Maybe it was in order to repair the damage that, in his May Day message, the chief minister announced his intention to legislate to introduce statutory private sector pensions, a long-standing Unite objective. 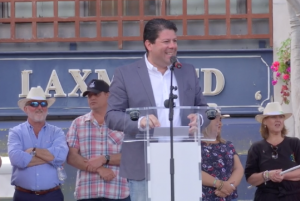 Fabian Picardo said he would consult: “with a number of organisations and sectors to ensure we have the best and most modern and progressive law possible for employees and for employers”. But one of the most influential employers’ representative bodies took instant umbrage. The chamber of commerce lamented that whereas the government appeared to have found the time to address the pensions issue with the unions, it had not had time “to hold meaningful discussions with the chamber or the private sector at large”. It called for “a period of true consultation to achieve an outcome which balances the interests of employers and employees alike”. Teachers. Unite. The GHA and the business community: four important constituencies the government has upset in the past few weeks. 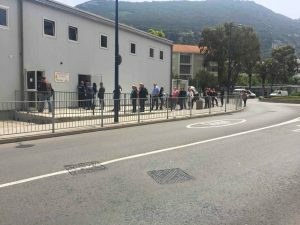 More than halfway through their second term of office the GSLP/Liberals would be foolhardy to ignore the warning signs. Before long it’s the whole electorate who will be consulted. When was the last time you visited the John Mackintosh Hall library? I couldn’t believe it, but it was at least 25 years ago for me. I know because I went to make my grandson a member the other day and thought I’d rejoin. It turned out I didn’t have to: I was still registered – at the address of our first home that we moved out of in 1993! 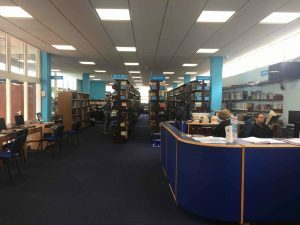 I was pleased to see quite a few school pupils using the facility but I think it’s true to say that with the advent of the Internet and e-readers, libraries have lost some of the relevance they enjoyed in the past. Which is a shame in my opinion. There’s a lot to be said for technology. It’s great, for instance, to be able to instantly download a book to your Kindle or highlight a word you’re not familiar with to get its dictionary definition. But there’s something special about losing yourself in a library. Taking time out from your busy schedule to roam among the rows of real, not virtual, books, occasionally taking one off the shelf that piques your interest to see whether you want it as part of your reading material for the next fortnight. It’s similar to the feeling you get when browsing in a good bookshop. I’m glad I rediscovered it. I think libraries help instil a sense of discipline. At the Mack Hall you can only take out two books at a time, so you have to choose carefully. You can have them for a couple of weeks after which you must return or renew them. And the 10p a day overdue fine won’t break the bank, but for young children it serves as an early lesson of the importance of being responsible. Our library has kept up with the times too. As a member, with my membership number and password, I can access and browse the catalogue online. I’m able to see what books are out and which are available, and even renew mine with a simple click. As I explained, the reason for renewing my relationship with the John Mackintosh Hall library was to sign up my grandson. The children’s section is excellent. 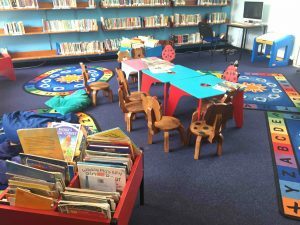 Besides containing a good selection of books, there are tables and chairs chairs and even a computer to encourage the younger members of our community to spend time in the library itself. 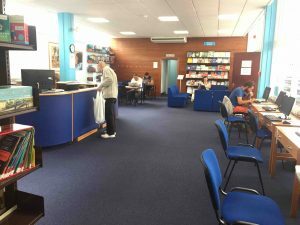 PCs are also available for adults, and other amenities include the daily newspapers, a reference library, audiobooks and a Gibraltar books section. Not to mention the friendly, helpful staff. If you like reading and, like me, have tended to neglect our venerable public library, do put that right. You won’t regret it. Have you heard of Second Life? I hadn’t until I read about it in Jamie Bartlett’s excellent book, The Dark Net. I’m probably well behind the curve because it’s existed since 2003 and is now on the decline, having peaked in 2007 when it had one million users. At present it has around 600,000 and Facebook and Twitter are said to be killing it off. Second Life is an online 3-D virtual world where “residents”, as they’re called, can pretend to be whomever or whatever they want. They create an avatar of themselves and inhabit an alternative world – their “second life”. Here they can interact with other avatars, go to live concerts, attend classes, build buildings and trade in virtual property and services using real money. It’s more a platform than a game as there are no set objectives and no one wins or loses: they just spend their time doing as they please. For many, it’s a release from the drudgery of their real existence. Learning about this make-believe world 15 years after its creation made me realise how limited my knowledge and experience of the Internet are. Sure, I can browse and send an email. I know how to upload and download stuff. I even managed to create this blog. But did I know what doxing (tracing and revealing someone’s identity), grief tourists (people who post condolences when they have no connection at all with the deceased) and flaming (insulting and provoking arguments online) were? Like hell I did. Yes, I was familiar with Internet “trolls” (a term, incidentally, that derives from trawling and not the ugly cave dweller of Scandinavian mythology), but had no idea how complex and sophisticated trolling can be. I’m about a third of the way through The Dark Net, at the point where Bitcoin is mentioned for the first time. Admittedly a lot has happened since the book was published in 2014. The author himself acknowledges that online life moves quickly, and says by the time you read it certain parts of the story will have changed. Nevertheless he asserts that the core theme, “what humans do under the conditions of real or perceived anonymity, will certainly have not”. 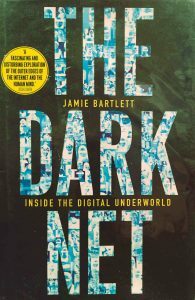 In its review The Spectator describes The Dark Net as “essential reading for anyone engaged with the web and the effects it is having on our culture”. For The Independent it: “shines an invaluable light on a world that remains determinedly opaque”. And The Guardian calls it “an intelligent and revealing introduction to the denizens of the web’s underworld”. For what it’s worth, I recommend it too. Have you ever had that feeling when there’s been a hitch with your flight that you’re not being told the truth, or at any rate the whole story, about what’s wrong? I have, many times. The industry term “technical issues” seems to conveniently cover a multitude of sins. It happened to me again recently. 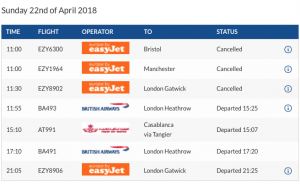 My wife and daughter were booked on the 11.30am easyJet flight to London Gatwick but were informed after they’d checked in that it had been cancelled. As had the earlier flights from the same airline to Bristol and Manchester. “Adverse weather conditions” – another useful mantra, especially to pre-empt compensation claims – was the official explanation. Which would be perfectly understandable if, as is so often the case, it had been blustery down there at North Front. But it wasn’t. Yes it was a dismal grey day, but it wasn’t at all windy. I’ve been on board aircraft that have landed and taken off in much worse weather. Your scepticism isn’t exactly dispelled when you hear an airport official say, quite openly, that the reason for the cancellations is that the radar system is inoperative and won’t be fixed for another six weeks at least. And yet radar or no radar, wind or no wind, subsequent British Airways and Air Maroc flights were able to land and depart as scheduled. Adding insult to injury, I saw with my own eyes the latter come in from Casablanca at 2.15pm just after I’d dropped my relatives off at the frontier to be taxied to Malaga airport for an evening flight to London! Modern day air travel is highly stressful. Airport security checks are ever more stringent, airlines provide fewer and fewer services as standard, and aircraft seats and the legroom between them are shrinking all the time. When I was younger, I felt my holiday started when I stepped onto the plane. Now it doesn’t until I’ve disembarked. Please, let’s at least be honest and up front with the long-suffering passenger when we give them the bad news that they won’t be reaching their destination just yet. In my 2018 “wish list” column in January I highlighted the lack of parking at the North Mole Road complex where the parcel post office and other government departments and agencies were until very recently situated. The nine spaces there for the public were totally insufficient and were often occupied by work vehicles anyway. Since then the parcel office has been hastily transferred to enable works on the new secondary schools to start. You can now find it off Bishop Caruana Road, opposite the Mid-Harbours estate. And guess what? There isn’t a single parking space! Maybe it’s part of the cunning plan to get us all to walk or use public transport. In conjunction with the shambolic residential parking scheme (Zone 2 and all that). I hear there will eventually be ten parking bays, but shouldn’t they have been available from day one? Apparently the new location is “temporary”. But so too were the premises just vacated at Waterport when the staff moved into them, all of eight years ago.